A defence QC has described the behaviour of a murder victim’s widow as “utterly appalling” on the night he died – and suggested the tragedy could have been avoided if they had just gone home. 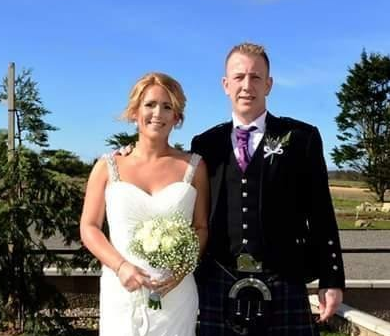 Gary Clampett, 39, died following a disturbance in Fraserburgh’s Fernie Place last summer. Seven men are on trial accused of murdering him by hitting him with knives, a machete, a sword, a chain, a hammer, a crowbar, a wrench, a stick, bats, golf clubs, poles and a metal bat. John Henderson, 47, Gary Martin, Joseph Martin, 40, Thomas Martin, 45, David Graham, 46, James Connor, 52, and Dean Leech, 25, deny the charge and are on trial at the High Court in Glasgow. During the trial, Henderson admitted killing Mr Clampett by “striking out” at him with a knife while being chased by his wife, Sharon Clampett, who was weilding a metal pole, and friend Rena Sutherland, who had a knife. But yesterday, defence counsel Donald Findlay told the jury that did not mean that everyone who was at the incident was responsible for Mr Clampett’s death. Urging them to acquit his client, Gary Martin, Mr Findlay said: “Mr Clampett died. He is dead because Mr Henderson killed him, there is no doubt about that. “It is for you to decide whether that was murder or culpable homicide. Unfortunately John Henderson killed Gary Clampett. He killed him because he took a knife and killed him. Turning to his widow Sharon Clampett, Mr Findlay told the jury: “She bears little responsibility for the death of her husband. One might expect that one of the emotions she feels about her husband’s death is guilt. Guilt for the part she played in it, guilt for not stopping it and guilt for actively encouraging it. The trial, before judge Lord Beckett, continues.